Last night my friend Mands & I went to see a “Girls Night Out” premier screening of Something Borrowed; the new rom-com starring Ginnifer Goodwin and Kate Hudson. I just want to say that this isn’t a movie review, but my thoughts on the subject matter. 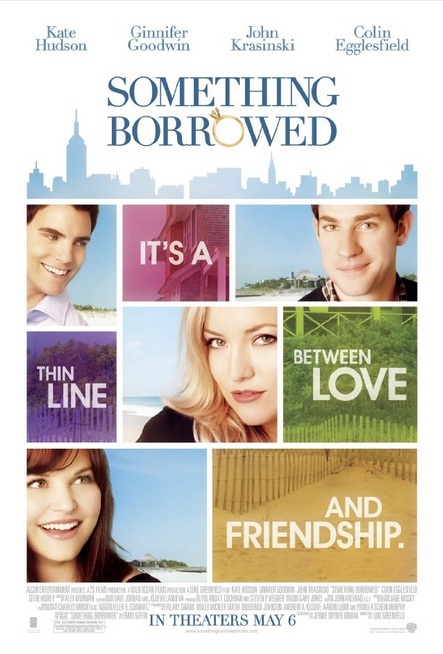 I love Kate Hudson playing a bitchy, self-obsessed character (think Bride Wars) and she’s pretty good in this movie, but the star is definitely Ginnifer Goodwin who plays the protagonist Rachel; a lawyer who always lets her best friend Darcy (Hudson) win in every aspect of their friendship. Darcy is engaged to Dex (played by Colin Egglesfield) who is (reluctantly) a fellow lawyer, Rachel’s college friend and almost-boyfriend. John Krasinski plays her good mate Ethan the budding writer and her voice of reason when she sleeps with Dex. From a glance the movie is superficially a romantic-comedy, but it’s not your average take on the genre. People who have read the book by Emily Griffin will know it’s not your usual recipe for chick-lit. We’re always programmed to hate the cheater but because the story is told from her point of view you sympathize with Rachel’s moralistic stray, betrayal and subsequent ethical dilemma between her feelings and what is perceived as right and wrong. The message of infidelity hit home to me; considering both the short and long term consequences. As an adult, I experienced the breakdown of my parents marriage due to my Dad’s infidelity. It’s hard not to take sides when you’re a spectator and even harder when you’re baked right into the center of the drama. It took a really long time for my Mum to get over his betrayal, but now she’s remarried and happier than she’s ever been in her life. She married the most wonderful man who treats her both like a partner and a princess. On the other side of the fence, 9 years on and my father is still with the woman he left my Mum for. While I won’t ever condone what he did and the way in which he went about it, maybe this woman was the right person for him and it was unfortunate that he’d been married for 25 years at the time he met her. After all the pain, it’s apparent that the path their life was on wasn’t the correct one for either my Mum or Dad. They were each other’s collateral. They are living their true life. I guess it goes to show that no matter what our best intentions are, who we try to protect (whether its ourselves, friends, partner or family) and what ethics we choose to follow or ignore, we can never truly know the real story. It’s not our business to judge. People in glass houses shouldn’t drop boulders.